CES, which last year attracted more than 152,000 people, is dedicating 40 percent more floor space to digital health exhibitors this year than in 2013. Cardiologist Samir Damani hasn’t really fit in at the International CES in Las Vegas, where 3-D televisions, connected cars, and the latest gaming consoles abound. Until this year. As founder of MD Revolution, Damani is developing software that lets consumers monitor their health, nutrition, and fitness on phones. At CES, formerly called the Consumer Electronics Show, he’s introducing RevUp, which uses data from devices such as Fitbit’s Wi-Fi scale and the Withings blood-pressure monitor and supplements it with lab tests to provide customized advice. Of the 3,300 companies exhibiting at the conference, starting Tuesday, about 300 are focused on digital health, said Gary Shapiro, president of the Consumer Electronics Association. Looking to gain customers in a market that is expected to quadruple by 2018, companies are unveiling wearable health and fitness monitors, sensors for the home, and software to tie it all together, providing real-time data for consumers. LG Electronics is introducing a fitness band; Reebok International is showcasing a skullcap with sensors; and the startup Lively, which makes sensors for the elderly, will show technology that lets other developers link to its products. Even with rising popularity, health-related wearables and fitness apps have limitations, said Nick Martin, a vice president in the innovation and research group at insurer UnitedHealth Group. While the technology helps consumers monitor activities and improve habits, it won’t remove the need for traditional care, he said. 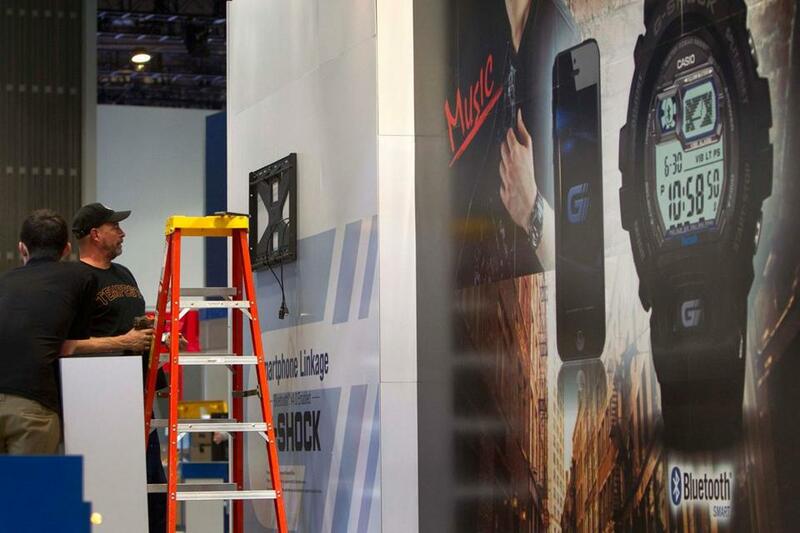 Since its debut in 1967, CES has been a hot spot for product debuts. That includes the videocassette recorder in 1970, compact-disc player in 1981, and Blu-ray disc players in 2003. ‘‘The wearables section and digital health sections are going to be huge this year,’’ said Shapiro, whose group runs CES. Digital health and fitness technology is starting to gain mainstream adoption. The market will grow to as much as $8 billion in revenue by 2018 from $2 billion in 2013, said John Curran, a managing director at Accenture in Seattle. ‘‘We’re seeing a really broad range of products and growing consumer interest in them,’’ Curran said. More companies are entering the digital health category now that regulators have clarified their position. In September, the FDA said it would apply oversight only to mobile applications that are used as medical devices and would exercise ‘‘enforcement discretion’’ on fitness-related apps. Declining costs of hardware components and the growing need for consumers to cut medical expenses are also spurring innovation, said Rob Lineback, an analyst at the chip researcher IC Insights Inc. The average price of a mobile-fitness system will fall to $100 by 2017, from about $215 today, he said.